The Common Crossbill is very similar to the Parrot Crossbill but has a slightly less powerful beak than the last species mentioned. These are specialist feeders on conifer cones, and the unusual bill shape is an adaptation to assist the extraction of the seeds from the cone. The Crossbill breeds very early in the year and has flying youngsters long before most of the migratory birds have arrived to the country. The young birds have streaked feathers. Adult females are gray-green, while adult males have strong red feathers. 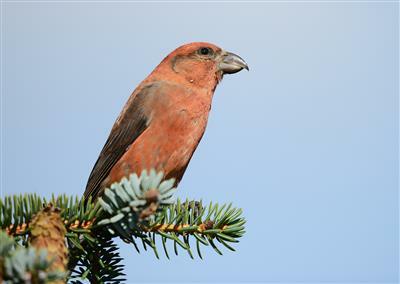 Crossbills are social birds that fly around in flocks looking for food.